SAN DIEGO, CA – Aug. 11, 2016 – Organizers of the GI Film Festival San Diego, presented by Sullivan Solar Power, have finalized the full 2016 schedule for the screenings, receptions, and related events. To be held Wednesday, Sept. 14 through Sunday, Sept. 18, 2016, the festival features 28 films for, about, and by service men and women and brings the stories of America’s military to life through film. Film screenings and related events will be presented at various locations throughout San Diego County. The films come from around the United States as well as here in San Diego and range from feature length films to shorts, which gives the audience an opportunity to view a variety of stories in a short amount of time. They are presented within themed blocks so audience members can fully immerse themselves in the festival experience. In 2016, several of the films focus on less known true stories that will satisfy just about any film aficionado’s appetite for a good story. Storylines include American POWs in Switzerland and Hiroshima, secret recordings by President John F. Kennedy, a young man forced to be in the German Army in WWII and ends up working for the United States, and the sneak preview of the full-length Ken Burns and Artemis Joukowsky III’s documentary about an American minister and his wife who travel abroad to save victims of the Holocaust. Another theme explored in this year’s festival is moral injury, which is the result of the participation in traumatic experiences that violate ones moral and ethical values, causing a shift in identity and self-expectations. “Thank You For Your Service,” directed by award-winning filmmaker Tom Donahue, is a film that examines how mental health advocates team up with soldiers to bring awareness to their struggles in a social and political way. Due to overwhelming popularity, the GI Film Festival San Diego’s Family Movie Night returns to the schedule on Friday, Sept. 16, 2016. The film (title TBD) will have three different screening times, allowing more parents and families to enjoy a night out to celebrate our troops at UltraStar Cinemas Mission Valley at Hazard Center. Out of the 28 films selected at GI Film Festival San Diego, 16 were presented at the GI Film Festival held in Washington DC in May 2016, including several “Best of Fest” winners. An animated short, “Tom’s War,” enjoys its world premiere at the festival, while another nine films will be presented on the West Coast for the very first time. Another nine films were selected for the Local Film Showcase. Featuring a variety of stories, these selections will be presented over the course of the festival with a majority of these local films shown on Sunday, Sept. 18, 2016 at UltraStar Cinemas Mission Valley at Hazard Center. “USS Indianapolis: The Legacy,” a film directed and produced by local filmmakers Sara Vladic and Melanie Capacia Johnson, will open the GI Film Festival San Diego on Wednesday, Sept. 14, 2016 at 7 p.m. at the Museum of Photographic Arts in Balboa Park. An encore screening of the film will be shown on Sunday, Sept. 18, 2016 at 3:30 p.m. at the UltraStar Cinemas Mission Valley at Hazard Center. Throughout the five-day festival, attendees will be able to vote for their favorite films to receive the “Audience Choice Award” at the Closing Celebration and Awards Ceremony on Sunday, Sept. 18, 2016 at the DoubleTree Hotel in Mission Valley at Hazard Center. Many of the events will be open to the public with special discounted opportunities for active duty military personnel and veterans. 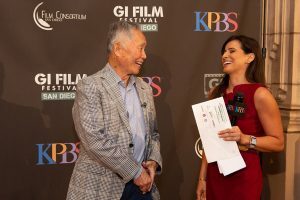 All Access Passes for entry into festival events and screenings are available now for $85 each on the GI Film Festival San Diego website at www.GIFilmFestivalSD.org. General admission tickets for select screenings and events are also on sale. The GI Film Festival San Diego presented by Sullivan Solar Power takes place Sept. 14-18, 2016. Additional festival sponsors are National City Mile of Cars and Scatena Daniels Communications with support provided by a grant from The Kenneth T. and Eileen L. Norris Foundation. The festival is organized by KPBS in partnership with the GI Film Group and the Film Consortium San Diego. A complete screening and event schedule follows. Schedule is subject to change. The GI Film Group is a full service media company dedicated to preserving the stories of military veterans. GIFG is the production entity behind the award-winning GI Film Festival (GIFF), a 501c(3), also known as “Sundance for the Troops,” which is held each May in Washington, DC. The festival is the first in the nation to exclusively celebrate the successes and sacrifices of the service member through the medium of film. The Film Consortium San Diego LLC is a social venture that stimulates film and television production in the region and increases networking, employment, education, funding and distribution opportunities in film, television and new media. The Film Consortium holds the Fall Film Festival, San Diego Film Awards, Winter Film Showcase, Summer at the Drive-in and various other screening and networking events. KPBS is a public service of San Diego State University, serving over one million audience members weekly across TV, radio (89.5 FM and 97.7 FM Calexico), and the web with content that is educational as well as entertaining—and free of commercial interruption. Please note that times and locations are subject to change. Please check www.GIFilmFestivalSD.org for event updates throughout the summer. Screenings begin at 6 p.m.
Filmmaker Q&A and panel discussions will follow select screenings. Screenings at 6:30 p.m., 6:45 p.m., and 7 p.m.
Film to be determined. Bring the kids and enjoy a special night of movie magic! Screenings begin at 12:30 p.m. Screenings & Events begin at 1 p.m.
2:30 p.m.: Permission to Speak Freely: KPBS’ Veterans Coming Home Project – This special event features a screening of five digital first pieces from the Veterans Coming Home Project. Veterans Coming Home is an innovative cross platform public media campaign that bridges America’s military-civilian divide through storytelling and public engagement. The screening is followed by a lively discussion with actors and writers from the local veteran community. Do you want to get involved in exciting military themed independent film productions happening here in San Diego? Are you an active duty or veteran filmmaker who wants to work with others on local productions? Are you in the filmmaking industry or have a film project you need help with? Come to the GI Film Festival San Diego’s “Military Pitch Fest and Mixer” to connect with fellow filmmakers, writers, and professionals. This event aims to support and promote San Diego’s military independent filmmaking community through the sharing of information and expertise, as well as developing resources that will be available to local military independent filmmakers. The “Military Pitch Fest and Mixer” is open to all who participate in the filmmaking process as well as active duty and veterans. Tickets to attend the “Military Pitch Fest and Mixer” are $10 per person. Tickets to attend both “Military Pitch Fest and Mixer” and the Closing Celebration and Awards Ceremony are $25 per person. Join us for the exciting culmination of the festival! Filmmakers featured in the Local Film Showcase will receive awards in multiple categories. An Audience Choice Award will also be announced, giving audiences an opportunity to vote throughout the festival for their favorite film.